Hyderabad, Dec 7 (IANS) With polling coming to an end for the Assembly elections in Telangana on Friday, both the ruling TRS and the main opposition Congress were confident of a victory. While the Telangana Rashtra Samithi (TRS) exuded confidence of retaining the power, Congress was sure that the People's Front led by it will form the next government. TRS leader K.T. Rama Rao said the party would win two-thirds majority in the 119-member Assembly. 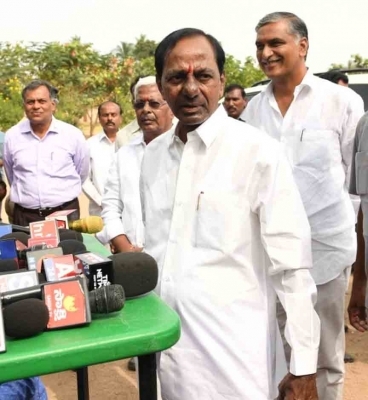 After voting in Siddipet district, Chief Minister K. Chandrashekhar Rao exuded confidence that the TRS would win the polls with a huge majority. Congress party's Telangana unit President Uttam Kumar Reddy, however, remained confident that the alliance would come to power. He told reporters that the alliance would win 85 seats. Congress Working President Revanth Reddy claimed that the people had given a mandate in favour of the People's Front. About 70 percent of 2.8 crore voters voted in the single-phase polling on Friday. Vote count will take place on December 11.